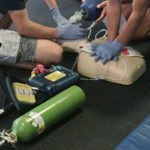 Skilled rescue swimmers find the Seabob Rescue sled puts more focus on the victim and less focus on getting to the victim. 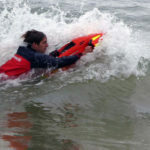 Lifeguards utilize Seabob Rescue with their heads out of the water and their eyes focused on the victim’s location. Swimming doesn’t allow this without taking a penalty for fatigue. 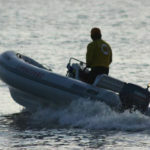 The Seabob Rescue craft allows a rescuer to continually observe the victim’s situation en route. 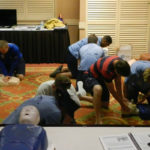 Professional rescuers arrive less fatigued and are more prepared for the rescue. This greatly improves rescuer safety and aids faster victim retrieval. 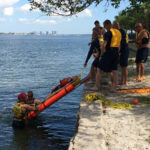 While a Seabob Rescue equipped beach lifeguard towers provide a tremendous coverage option for professional lifeguards, modest beach lifeguard department budgets typically limit full coverage. 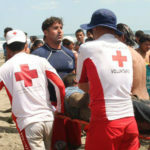 Beach lifeguard captains often position their Seabob Rescue lifeguard sled near challenging areas of the beach, especially those with known riptides and whirlpools. They know Seabob Rescue provides a greater margin of safety to get into and out of these challenging surf conditions. 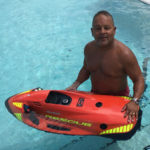 Seabob Rescue is equipped with attachment points for additional rescue response gear. For example, tube buoys and backboards can be attached and pulled behind the rescuer. 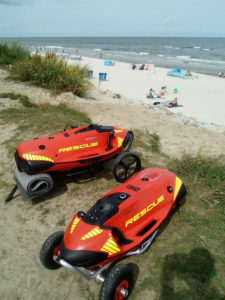 Each Seabob Rescue can be modified to support the specific needs of the beach or fire and rescue department they serve. Additionally, a water-resistant radio or camera could be mounted on the craft’s utility platform.